Mark is a Director of ILS Management across EMEA for Aon, he is also responsible for marketing and new business initiatives within the Guernsey office. Mark is a Chartered Insurer, and has spent over 15 years in underwriting, client management and new business roles in the insurance and reinsurance sectors. He has a wide range of experience managing (re)insurance companies and protected cell companies across a range of industries. 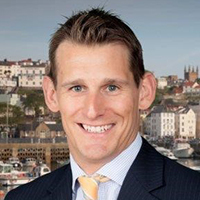 His previous positions include 10 years at an independent captive manager in Guernsey, and Chief Underwriting Officer at an Aon managed client, where he later moved across as a full time Aon Employee in September 2017 as Director of ILS Management (EMEA) and New Business Director of Aon Guernsey. Mark is the deputy Chairman of the Guernsey International Insurance Association, having been a committee member for over four years.